Larry Minear will be one of the panelists at a Workshop on Healing the Culture of Non-Violence to be held on Saturday Nov. 9 from 8.30 a.m. — 1 p.m. at the Church of the Holy Spirit, 204 Monument Road, Orleans, MA. The other two panelists are Dianna Morton, co-founder of the Massachusetts Media Literary Consortiumand Lysetta Hurge-Putnam, Executive Director of Independence House. For information or to register, contact Fr. Ken Campbell at ksbcampbell@verizon.net. At 2:00 PM, Larry Minear will make a presentation on Carnage and Conscience in Afghanistan and Iraq. The meeting, in the Eldredge Public library on Main Street in Chatham, MA, is co-sponsored by the Cape Cod Chapter of the Fellowship of Reconciliation and the Corporal Jeffrey M. Lucie Chapter of Veterans for Peace and is open to the public. 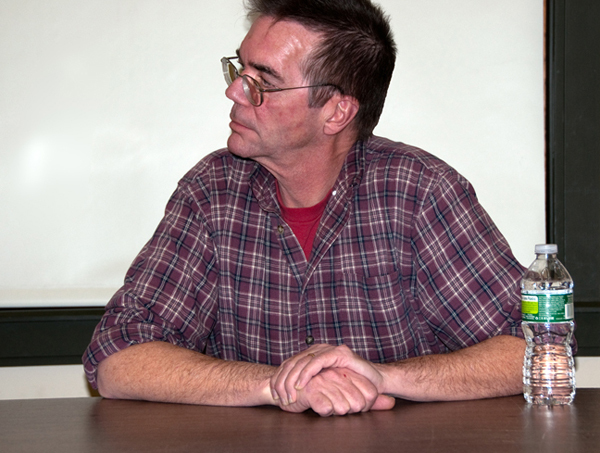 Larry Minear made a presentation at the Boston Campus of the University of Massachusetts to a Veterans History Project class in the school’s Urban Scholars’ program. The after-school college preparatory program provides Boston Public School students an opportunity to augment their academic skills by paying them a stipend to take two hour classes twice a week. Later in the semester, the students will each interview a veteran and contribute the results to the Veterans History Project in the Library of Congress. The class is taught by a veteran, Travis Bickford, and involves other veterans studying at U Mass as well. Larry Minear will be interviewed on Maryland Morning with Sheilah Kast, airing on WYPR Baltimore (88.1 FM, Maryland Public Radio). Also participating is Major General James Adkins, who heads the Maryland National Guard. Larry Minear will attend a workshop in Hyannis MA on Transitioning from Combat to Home, sponsored by the Cape & Islands Suicide Prevention Coalition. Larry Minear presented his findings and conclusions to a mini-reunion of the Yale College Class of 1958, held in Chicago, Illinois. His presentation was followed by comments and discussion among classmates. Larry Minear presented the highlights of Through Veterans’ Eyes to several gatherings of students at New Trier Township High School in Winnetka, Illinois. Discussion of the book at 7:00 p.m. at The Book Stall at Chestnut Court, 811 Elm Street, Winnetka, Illinois (847-446-8880; www.thebookstall.com) Contact: Caitlin Eck. Book talk at 7.30 p.m. the Teichman Gallery, Route 6A, Brewster, MA. Reservations required; $5.00 donation requested (508-896-2395). “Orange County and the Global War on Terror,” a presentation by Larry Minear at a meeting of the Rotary Club, Happy Hour Restaurant, Wells River, Vermont. The presentation will be at 7:00 p.m., preceded by dinner. For information, contact David Perry, 802-222-9211. Enlarged photographs from Through Veteran Eyes: The Iraq and Afghanistan Experience will be on display at the World Conference on Humanitarian Studies, being held at Tufts University June 2-5. Each of the photographs was taken by a veteran who served in Iraq or Afghanistan. In the book veterans describe the circumstances of each photo and its personal meaning. The display is located in the Alumni Lounge of Alumni Hall at 150 South Campus Road on the Tufts campus in Medford, MA. The exhibition is open to the public on Thursday (5:00 p.m. – 8:30 p.m.), Friday and Saturday (9:00 a.m. — 5:00 p.m.), and Sunday (9:00 a.m. — 12:00 p.m.). Copies of the book will be available for purchase in the lobby on Friday morning and at other times in the Tufts University Bookstore across the street. For further information, contact Kate Montgomery at 609-947-0781 (kate.montgomery@tufts.edu). Larry Minear will participate in an event at the Wellfleet MA library, “The Experience of War: A Panel Discussion with Veterans, Family and Home Front Supporters.” The discussion, which runs from 7:00 — 8:30 p.m., is open to the public without charge. “Through Veterans’ Eyes: The Iraq and Afghanistan Experience” will be the subject of a panel discussion in the Guilford CT Library on Thursday, March 31 from 7:00 — 8:00 p.m. Joining Larry Minear will be Jonathan Trouern-Trend, a member of the Connecticut National Guard who wrote Birding Babylon: A Soldier’s Journal from Iraqduring his first deployment (Sierra Club Books, 2006). He returned from his second deployment in August 2010. The library is located on the Guilford Green at 67 Park Street. The program is free. Places may be reserved by calling the library (203-453-8282) or visiting its website (www.guilfordfreelibrary.org). Books by both authors will be available for purchase and inscribing. Larry Minear has inscribed a copy of his book for inclusion in the library of the USS New York, a new U.S. battleship to be launched in 2012. The ship will incorporate 24 tons of steel salvaged from the Twin Towers. A library is being assembled which will serve as a resource for ship’s 360 sailors and 700 combat marines. “The Wars in Afghanistan and Iraq: Reflections by Veterans and their Families.” Panel discussion involving Larry Minear, Lance Corporal Christopher Sullivan who served in Afghanistan in 2005-2006, and Barry Donahue, local newspaper photographer and father of a Marine who completed his second deployment in Afghanistan just before Christmas. Photographs courtesy of Judith Gardner. 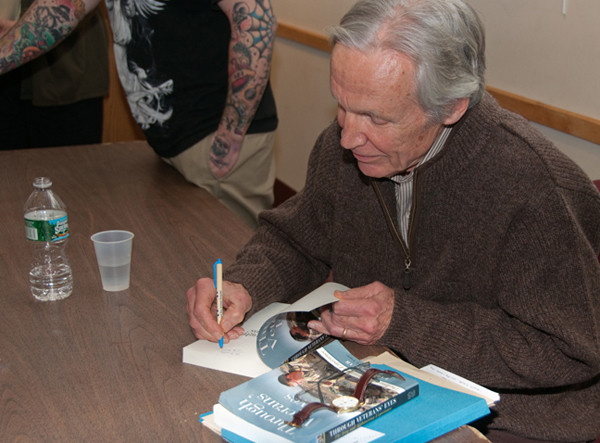 Larry Minear inscribes copies of Through Veterans Eyes following the Brewster panel discussion. Whittall Pavilion, Jefferson Building, Library of Congress, Washington, D.C. The panel will include several veterans whose experience is recounted in the book. The discussion is open to the public. 4:00 p.m — 5:30 p.m. The panel will include, in addition to Larry Minear, two veterans now enrolled at Tufts and one staff person whose husband is currently deployed in Iraq. The discussion will be followed by a reception. An exhibit comprised of photographs and other illustrative materials from Through Veterans’ Eyes will be on display in the Slater Concourse Gallery of the Aidekman Arts Center at 40 Talbot Ave. Medford, MA 02155 from November 2 — December 19, 2010. Limited parking for the art gallery is available behind the building. Thursday, October 7, 2010 6:00 — 7:30 p.m.
Panel discussion on “The Veteran’s Experience,” one event in a series entitled Soldiers, Citizens, Scholars: Building Community Awareness of Veterans’ Contributions and Experiences. The panel will be comprised of Larry Minear, Brigadier General Deborah L. Carter of the New Hampshire National Guard, and several veterans from the student body. Saturday, Sept. 25, 2010, 10:00 a.m. — 5.30 p.m.
Larry Minear will discuss his book in the Veterans History Project area of the Library of Congress Pavilion, located near Fourth Street N.W. on the Constitution Avenue side of the Mall at 11.00 a.m. and 2.00 p.m. He will sign copies of his book, which will be available for purchase, throughout the day. The Festival is open to the public without charge. Forthcoming book featured at Library of Congress Commemorative Event. The Veterans History Project of the Library of Congress is celebrating its tenth anniversary. 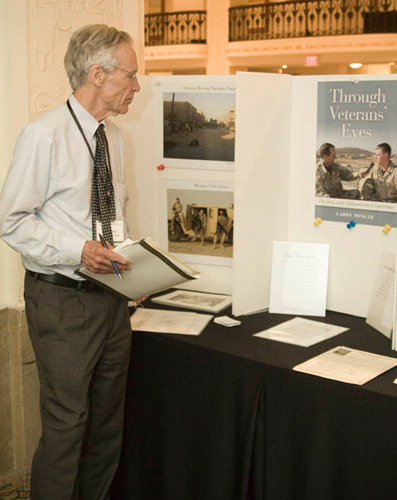 At a commemorative event on April 14, 2010, Through Veterans’ Eyes was one of a number of uses of VHP materials that was featured. In making the rounds of the exhibits, Dr. James H. Billington, Librarian of Congress, commented that he wished that fuller use would be made of the rich resources of the Library’s collections. 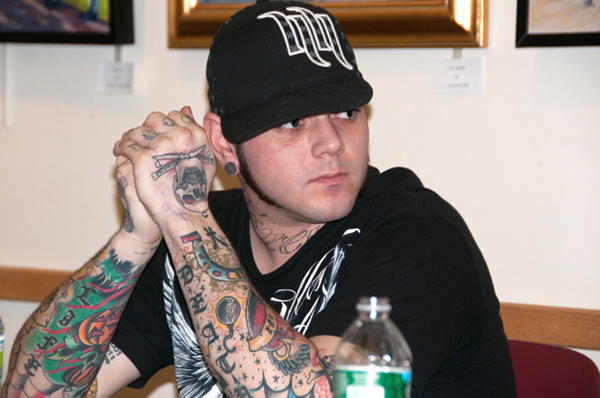 Author at gathering of veterans organizations. The author participated in the third annual conference of the Coalition of Iraq and Afghanistan Veterans (CIAV), held in Washington, D.C. May 11-14, 2010. Laying the groundwork for the release of the book in June. 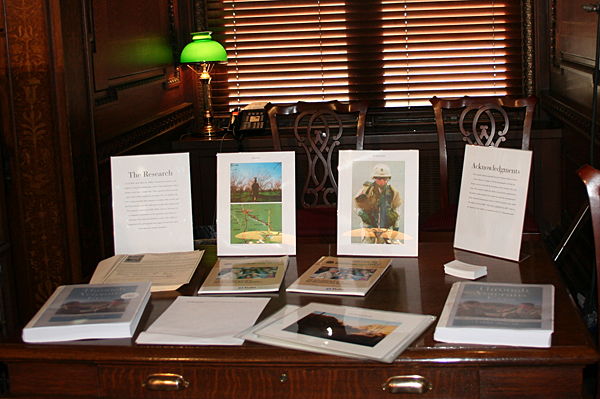 his booth displayed samples from the book, including photographs and a list of veterans quoted in the study. The conference itself, attended by representatives of CIAV member organizations and addressed by veterans, federal and state government officials, and members of the media, provided an excellent opportunity for monitoring the issues and networking with those involved.